In the afternoon of December 21, 2017, Master Group and Hanas Group held a seminar on the 19th National Congress of Communist Party of China (CPC). At the invitation of the two groups, Li Jinying, delegate of the 19th CPC National Congress, Deputy CPC Secretary and Vice President of Ningxia Higher People’s Court, gave a lecture on the milestone congress. The seminar was chaired by Xu Changning, CEO of Master Group and Hanas Group, and was attended by group vice presidents Ren Fenglan, Wang Shaobo, Zhang Yi and Du Yanzhong, heads and directors of key business units and functional departments and staff representatives. Group CEO Xu Changning reiterated the seminar was held to help company employees to fully study the spirit of the 19th CPC National Congress and arm their minds with the very spirit to guide them in their practice, facilitate their work, push forward the development of the company and the society, drive forward the developments of China’s clean energy and new energy industry, and make due contributions to a brighter, cleaner and better future. Xu said Hanas Group, focusing on clean energy and new energy, has grown into a large international energy conglomerate with a diversified business covering “natural gas, power generation, wind power, solar power, heating and cold”. Grasping the spirit of China’s oil and natural gas mechanism reform and ensuing opportunities, Hanas Group has successfully deployed key natural gas projects in Putian, Fujian Province, Zhuhai, Guangdong Province, Jiangyin, Jiangsu Province, Ordos, Inner Mongolia and Ningxia, thus steadfastly constructing two energy hubs in Northwest China and Southeast China and building up a complete industry chain across the upstream, midstream and downstream markets of natural gas. Meanwhile, Hanas Group has invested in the Hangjin Banner to Yinchuan natural gas pipeline connection project. When completed, the pipeline will deliver Sinopec natural gas to Ningxia which will be a second source of natural gas other than PetroChina. 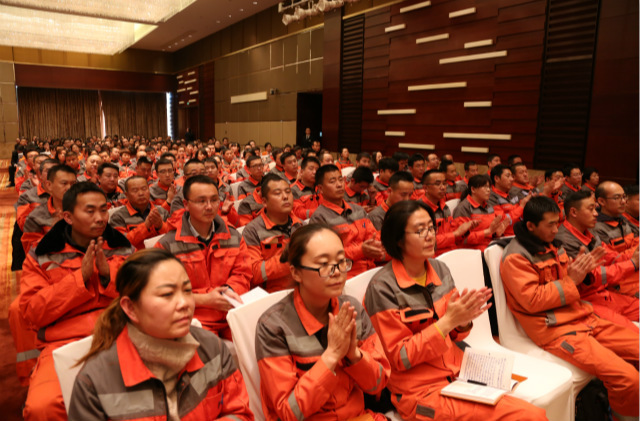 By then, Ningxia people will benefit from sufficient natural gas from diversified sources. In long run, the pipeline will also provide natural gas to a 5 MTPA LNG base in Ningxia’s Yanchi County, which will further increase the consumption of natural gas, optimize the energy structure and contribute to environmental protection. Delegate Li Jinying pointed out that General Secretary Xi Jinping expounded the strategic deployment of speeding up the reform in the ecological civilization mechanism to facilitate green development and the construction of a beautiful China. We must build up and practice the ideal that “lucid waters and green mountains are our invaluable assets” and participate in the construction of an environment governance system with the Government as the leader, enterprises as the main force and social organizations and general public as practitioners, Li said. Li expressed her admiration for Hanas Group for its fast developments and achievements in recent years. She said, as an excellent energy group company, Hanas Group is a force which cannot be ignored in the ambitious process of building up China’s ecological civilization. That’s why Hanas should shoulder due social responsibilities at all times and its leaders and CPC members should lead exemplary roles to study well the congress spirit and practice the very sprit in their real work and transform their political consciousness into practical work while its employees should take on a new look, have new initiatives and shoulder new responsibilities, to infuse Xi Jinping’s thought of New Era Socialism with Chinese Characters into the soul and blood of the company and guarantee the implementation of the spirit of 19th CPC National Congress to facilitate new development of a new energy company in New Era. Seminar participants unanimously agreed delegate Li Jinying’s lecture helped them to have a more thorough and more comprehensive understanding of Xi Jiping’s thought of New Era Socialism with Chinese Characters, and have an accurate mastery of the target and strategies set up by the 19th CPC National Congress. They said they would implement and practice the spirit of the 19th CPC National Congress in their daily work, use the very spirit to arm their heads and minds and guide their work so as to work hard to realize the Group targets.